"We've got this sewer gas smell. Can you find where it's coming from? Other plumbers have tried but can't figure it out." The answer is "YES" with Smoke Testing. Diagnose the problem and you may have an instant repair order! "It's so easy to learn to do. I had no experience, but I picked it up in a day and mastered it in about a week." "I found a dry floor drain, covered with vinyl tile, beneath a freezer that was giving off foul odors." "It's less expensive than a sewer camera, and often gives a quicker, more reliable diagnosis." "My competition gives me referals now." "With smoke testing I knew it was a bad wax ring on the commode in 5 minutes without guessing." "Customer complained of sewer smell in house. We smoke tested and found a dry trap and a cracked vent stack in the wall." "I made back my investment the first day." Smoke testing will diagnose tricky odor problems, find dry traps, bad plumbing connections, cracks/holes in pipes, and show direction odors travel out of roof vents. Simply find an exterior clean-out to attach the smoke blower to. Blower may also be used through roof vents or other access if necessary. CLICK HERE for more info on procedures. Smoke testing is easy to learn and master, and we've just made it easier for you to get started with the Smoke Testing Starter Kit. Everything you need to get started: Blower, smoke cartridges, plus comprehensive instructions. Starter Kit includes professional air/smoke blower, 2 canisters of ecoflo smoke cartridges, and detailed instructions. Click on "more images" below to see these items. Specifically calibrated for residential/commercial smoke testing. Other blowers may not deliver the correct CFM and static pressure. Too little, and the smoke won't circulate properly for a good test. Too much, and the smoke can be blown past the traps, giving faulty results. 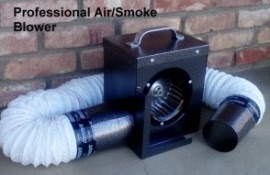 Perfect for residential/commercial smoke testing. Container seals tightly and is great for carrying in toolbox or truck. Pellet burn time is 60 seconds, generates 16 cu. yds. of smoke. Burn time 60 seconds. Generates 8,000 cu. ft. of smoke. Item is at top/middle in picture. Burn time 3 minutes. Generates 40,000 cu. ft. of smoke. Item is at top/right in picture. Burn time 30 seconds. Generates 4,000 cu. ft. of smoke. Item is at top/left in picture. Burn Time: 20 seconds, Volume: 2.5 cu. yds. Designed to test drafts on gas appliances, chimneys etc. Short duration. Clean, neutral white smoke. Also useful to test smoke alarms or find engergy leaks around windows and doors.